In the unconventional-resource era, the oil and gas industry has created an ideal environment for private equity investment, says Russell Weinberg, founder and managing director of Energy Capital Solutions in Dallas. Greater leasehold, drilling and completion costs—along with higher predictability and lower risk—allow private equity with an appetite for scale to deploy large capital commitments with a reasonable rate of return. To be sure, the industry has shifted to take advantage of the opportunities of unconventional resources, and if that also means attracting huge volumes of private equity, so much the better for operators and investors.Weinberg notes that many operators need assistance in communicating their capital requirements to potential investors. That discipline in turn has revealed further opportunities. “We are serving more and more private-equity firms that are making room in their portfolios to pursue conventional development,” says Scott Trulock, managing director. Nuances like this illustrate why management teams seeking capital like to hire intermediaries. 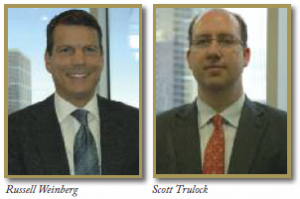 “We understand the entire private-equity universe, not just the name brands,” says Weinberg. Weinberg founded ECS in 2001, and since then the firm has completed $7.2 billion in transactions (136 deals), including $3.8 billion of private capital raised through 92 deals. Weinberg has more than 24 years of investment banking experience including RBC Dain Rauscher Wessels and Thomson McKinnon. He has focused most of his career in covering primarily exploration and production companies and other energy-related companies. Before joining ECS in 2003, Trulock was with Deutsche Bank Securities in the Energy, Power, and Chemicals Group. Previously, he was a chemical engineering consultant with Berwanger Inc., where he focused on refineries, petrochemical plants and midstream processing. ECS’ most recent closed transactions include a $200-million private equity placement for Excalibur Resources and a series of transactions for Le Norman Properties, including a $350-million private-equity placement with Trilantic and First Reserve Corp. It also included a $250 million, senior secured credit facility with Carlyle Energy Mezzanine Opportunities Fund. The way that private-equity firms and the teams they back get to build long term relationships, including multiple portfolio company formation and divestiture cycles with the same team, is by working toward a foundation of common objectives. “There is a lot more to the process than obtaining term sheets and shaking hands on a deal,” says Weinberg. “We help management teams make things easy for the private-equity side of the table by articulating the use of proceeds clearly and modeling the economic outcome with well-supported assumptions. We also work throughout the final documentation process to help teams understand potential pitfalls and secure the best possible terms. The more efficient the process, the better for everyone. “Management teams who present a strong, financially supportable business case, are prepared for diligence and are ready to execute immediately, stand out to private equity,” Weinberg says.